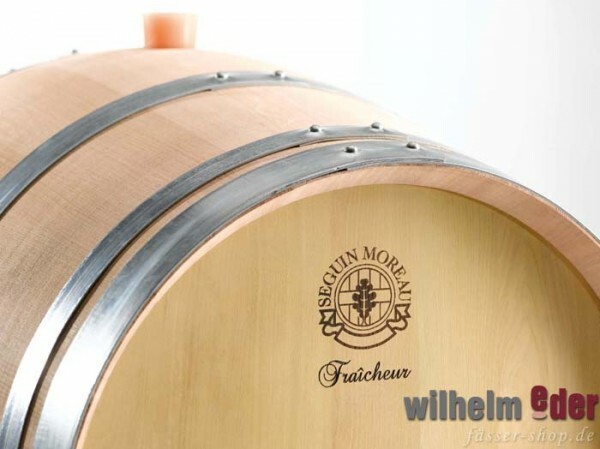 Product information "Seguin Moreau Fraicheur 225l - 228l - 300l - 500l"
Fraîcheur is a “mixed” barrel, i.e. it integrates several species of wood, with a design to enhance aromatic delicacy in white wines. Composed of a French oak body and acacia (Robina Pseudoacacia) barrelheads, it is the result of SEGUIN MOREAU’s research and several yearsof cellar trials. 1- Implementation of a specific gentle toasting, preceded by bending andshaping using immersion in hot water. This process limits the supply of toasty notes and contributes to the liveliness of the wine. 2- Use of acacia wood for the barrel heads. This reduces the contribution of whisky-lactone and ellagic tannins, compounds sometimes involved in contributing excessive wood impact or the “riper/more oxidative” perception of wines. Fraîcheur is intended for white wines that the winemaker seeks to express grape variety specificity, while still respecting the wine’sfresh and floral character. Principal grape varieties recommended: Chardonnay, Sauvignon blanc, Sémillon, Muscadelle, Marsanne, Roussanne, Viognier, Verdejo, Pinot gris, Riesling, Petit and Gros Manseng. • Aroma: Light notes of lime, white flowers, fresh and subtle aromas. • Alcoholic fermentation: Recommended in barrels, either complete or partial, depending on cellar practices. • Recommended aging duration in barrel: 5 to 8 months on lees after fermentation. • Rackings: No intermediate rackings, only one final racking. We advise against carrying out rackings during aging. This could provoke premature oxidation of the wine, due to the sudden supply of oxygen and loss of lees, which play a necessary protective role. It would act in opposition to the oenological objective of preserving freshness and specificity.